I love cranberries. I do. I love Ocean Spray whole cranberry cranberry sauce. It has to be whole berry and I’m addicted to it. I can’t even serve a roast chicken without cranberry sauce. We were once out of cranberry sauce (which I didn’t realize) as I put the chicken on the table and I started crying. Literally. Alan was so annoyed at me he stormed out and bought ten cans of whole berry cranberry sauce and we had a very pleasant dinner. The roast chicken was very good by the way. But it just feels naked to me without the “sauce” and gravy might do the trick but it’s fattening and bad for you and over-indulgent on a Wednesday night. 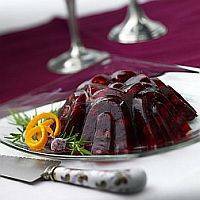 On Thanksgiving, I like to take two to three cans of Ocean Spray, put them in a decorative mold (like you make a bundt cake in) but I have one that’s in the shape of a rose, put it in the fridge for three hours and then carefully place a plate over it, hit the bottom of the pan and serve it on the plate and pretend I made it myself. 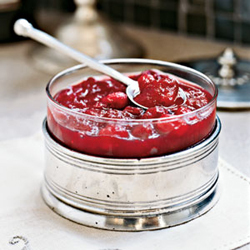 My friend Carol Caldwell once made a spiced up cranberry sauce for Thanksgiving that we thought was pretty great. She has no recollection of this. But I do. What I remember is that it had jalapenos in it, a kind of zingy (or California) addition and some kind of alcohol (which may be why she doesn’t remember it). I think it was bourbon. She thinks it was Vodka. I’m pretty sure I’m right. And for sure, a little bit of grated orange rind for flavor. By the way, this would be really good even without the alcohol, which is totally optional. Mix everything together and chill until dinner is ready.